Published by: American Medical Association and Decision Health, LLC. A must-have for all orthopedic coders! 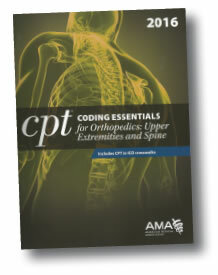 CPT® Coding Essentials for Orthopedics: Upper Extremities and Spine 2016 provides a foundation that facilitates correct code assignment in a format that is simply organized, displaying pertinent information for the CPT® codes with diagnostic codes, procedural descriptions, illustrations, relative value units (RVUs), and so much more. The book is broken down into chapters that cover various topics relating to orthopedics. Chapter titles include Terminology, Abbreviations, and Basic Anatomy, as well as Introduction to ICD-10-CM and ICD-10-PCS, Anatomy and Physiology, ICD-10-CM Documentation, and CPT® Procedural Coding. Each CPT® code/range is designated to a page or two to provide an immense amount of important information. Not only is there the official code description, but there are AMA Coding Notes, a plain-English description of the procedure, images demonstrating the procedure, ICD-9-CM as well as the ICD-10-CM diagnostic codes, ICD-10-CM coding notes, CCI Edits, AMA CPT ® Assistant information, as well as Facility and non-facility RVUs, and last but not least, modifiers that can be used with the code(s). The information provided for each code is almost overwhelming but is organized in such a way that even a novice coder could figure a lot out just by referring to it. Get 20 CEUs and Webinars on us each year! Search for ICD-10-CM, ICD-9-CM, HCPCS codes.